Fillings are very common with dental work, as they present a way to repair a tooth that has suffered from decay or a cavity back to its original shape. When performing a filling, the dentist will remove the decayed area of the tooth, clean around it, then fill in the area that he has removed with a special material that will cater to the shape and form of the tooth. The gold fillings that are used are made in a laboratory, then cemented into place by the dentist. Gold material fits well with the gums, and can last you for many years. Gold is considered by many to be the best, although it may require you to visit the dentist a few times before the filling will be complete. Silver fillings are another good option as they can be quite resistant to wear but are dark in color. Consequently, they are easier to notice than composite or porcelain fillings and are not recommended for visible areas of the mouth, especially the front teeth. Composite fillings are a common type of material, as they match the color of your teeth. The material that makes up the composite filling is mixed then placed directly in the cavity, where it hardens. They last several years, although composite isn’t recommended for large cavities, or areas where they may chip. The final type of filling is porcelain. Porcelain is very common, and produced in lab where it will be matched to your teeth then bonded to the affected tooth. Porcelain fillings match the color of your teeth, and are resistant to any type of staining. If a stronger material is needed in the filling, porcelain will be your best choice. Keep in mind that only a dentist can make the decision regarding fillings. 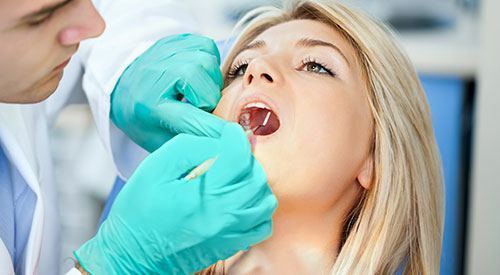 When you visit for your routine checkup, the dentist will look in your mouth and use instruments that will let him examine the surfaces of your teeth. If he finds any cavities, he will usually recommend a filling. You won’t feel pain as Dr. Okuyama will numb the area he is going to be filling. It normally takes less than an hour, and you’ll be up and at ’em before you know it. A filling is great for cavities, as most look natural and they won’t result in the loss of your tooth.